The Underdepths are ruled by cruel demons, as well as a population of elf demon's that abandoned their forest homeland for the promise of ultimate power. The Underdepths units do one thing and they do it very well: they deliver pain and punishment. 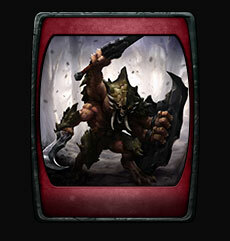 Their key stat is damage, and are populated with some of the hardest hitting melee champions in the game. If you enjoy playing hard-hitting close-combat units, The Underdepths may be the faction for you. 15/15: Champions you control with a maximum range of 3 or less receive a +2 DMG buff. Champions you control with a maximum range above 3 receive a +1 DMG buff. Full Faction: Champions you control with a maximum range of 3 or less receive a +4 DMG buff. Champions you control with a maximum range above 3 receive a +2 DMG buff.